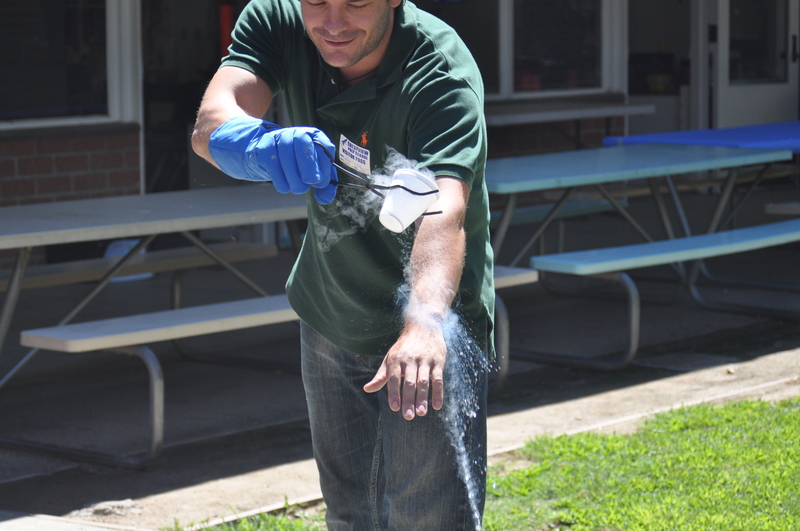 A few weeks ago, my friend Amanda, an elementary school teacher who runs a children’s camp during the summer break, suggested that it could be fun for me to come into the camp one day and do some science demonstrations for the kids. I jumped at the opportunity, despite (or perhaps because of) the fact that I am a purely theoretical physicist and my day-to-day work only involves whiteboards and computers at Caltech. Most of the children attending the camp are relatively young (7-9 year-old kids) so, rather than setting out to give a science lesson, I viewed it as a chance to do some fun demonstrations and get these kids excited about science! Besides, I had an ulterior motive; it was a great excuse to acquire, and play with, liquid nitrogen (LN ) from a Caltech lab (of which most of the IQIM labs have copious supplies). LN is great for demonstrations; this stuff is awesome! At a temperature of (for reference, the coldest temperature ever recorded on the surface of the Earth is ), it behaves in ways unlike anything that most people have ever seen. I convinced my friend Carmen, a postdoc in astronomy at Caltech, to come along and help out. Here, I thought I would share my experience, as well as some of the things I learned about handling LN . Carmen watches on as I pour the liquid nitrogen into the beaker, which boils like crazy until the beaker is chilled. The white gas is actually water vapor condensing from the air; nitrogen gas is transparent (think of your ability to see through air, which is mostly nitrogen gas). Liquid nitrogen volcano! All it takes is a little water added to the liquid nitrogen dewar. Crime and punishment: As anyone who has seen Terminator 2 knows, objects that are pliable at room temperature become brittle and can shatter when reduced to cryogenic temperatures (including robotic assassins from the future). Thus I devoted a significant amount of the demonstration time to freezing and breaking everyday objects, including flowers and rubber toys. The flowers were particularly spectacular, shattering like glass into a multitude of pieces when struck against the table, providing a good deal of entertainment for the audience as well as myself. Hasta la vista, baby. I also froze several pennies, which then became brittle enough such that Carmen was able to shatter them with a few taps from a hammer. Incidentally, destroying US currency is illegal (which is why I had Carmen do it instead of doing it myself). 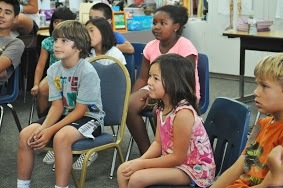 I informed the children of this fact and asked who among them thought that Carmen should go to prison for her crime. A quick vote revealed that the majority of the children thought that she should be behind bars. Sorry Carmen, maybe the next field trip for the camp can be to visit you in prison? A flower, freshly pulled from the vat of liquid nitrogen, prepares to make the ultimate sacrifice in the name of science. After having frozen a variety of objects, one of the children asked me whether you could freeze people with it. I told the kids that this is something that I always wanted to try, but that I had previously lacked a volunteer, to which an enthusiastic boy jumped up and responded, “freeze me, freeze me!” I asked whether he wanted to be frozen 5 years, 10 years, or longer? He said he would like to be frozen until the end of the world. One must admire his dedication! Before attempting to freeze him, I told him that it would be prudent for me to try it on something less likely to have litigious relatives. 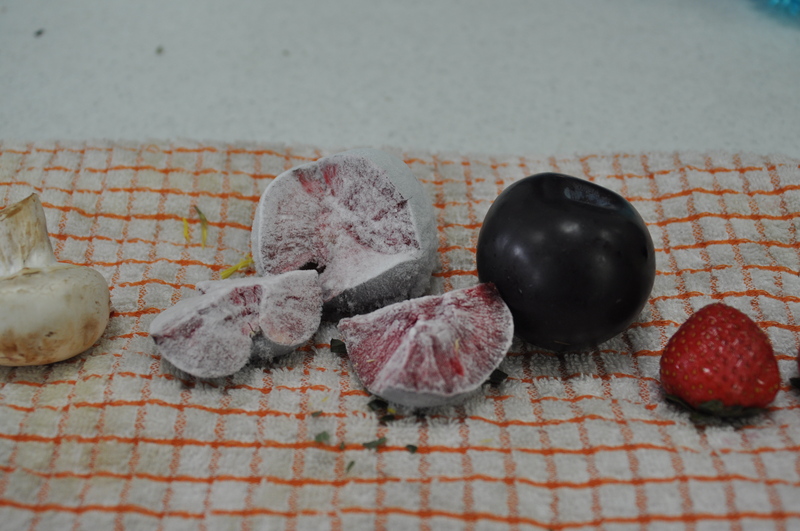 To this end a strawberry, a peach and a plum were submerged in LN , and then removed and allowed to slowly thaw. They ended up melting into gelatinous blobs; clearly some kinks in my cryogenic freezing and revival process need to be resolved before I graduate the approach to small children. Why did the fruit melt into jelly upon thawing? Rapid freezing of animal or plant material can cause their cells to burst, both from the expanding ice within the cells and the formation of sharp ice crystals. If the cooling is done slowly enough then the bursting of cells may be avoided, but, if tried on a person, the formation of ice between cells would still cause serious permanent damage (that is not repairable with existing technology). Despite this, many people are currently opting to have their bodies (or even just their heads) frozen when they die, in the hopes that future advances in bioengineering and nanotechnology could one day be used to revive them. Far fetched, but not beyond the realm of possibility, I suppose. Science! Don’t try this at home: Despite its fearsome reputation as a cooling agent, the heat of vaporization (the amount of energy required to go from liquid to gas) of LN is relatively small, so it can take much more LN than you might expect, in order to freeze something. Nevertheless, a cup of LN is a sufficient quantity that, were you to hold your hand in it, it would result in a nasty cryo-burn and probably permanent tissue damage. Thus, one would also think that pouring said cup of LN over the exposed skin of your arm would be an equally unpleasant experience; yet this is exactly what I did for one of the demonstrations! 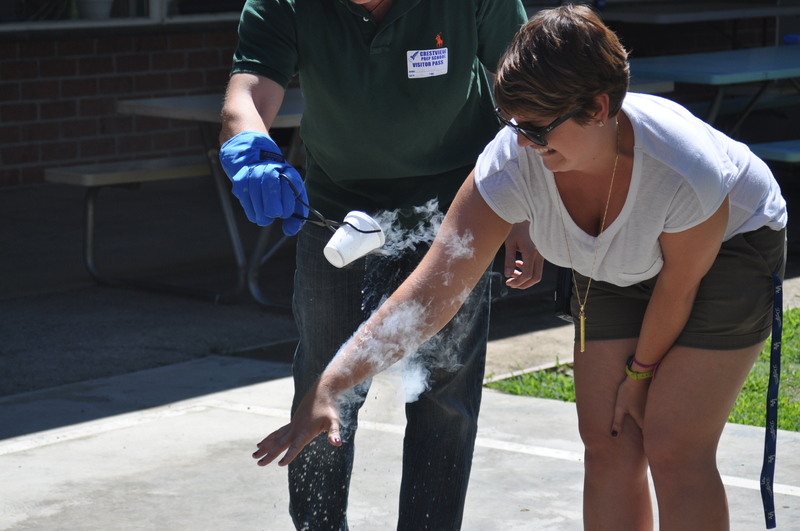 I pour a cup of liquid nitrogen over my outstretched arm (while enjoying it immensely)! How did I avoid an embarrassing trip to the hospital (where I would have had to explain that my arm was cryo-burned while pouring liquid nitrogen on it in order to impress small children)? The secret is something called the Leidenfrost effect. Believe it or not, most people, especially those who do a lot of cooking, would already be familiar with the Leidenfrost effect (though probably not by name, unless you were a science geek). Imagine putting a few drops of water on a frying pan that is sitting on a hot stove top. Usually the water will vaporize fairly quickly, but if the heat is turned up very high, then the water forms into beads which persist for a much longer time. This is the Leidenfrost effect: when a liquid is in contact with a surface hotter than the liquid’s boiling point, a vapor layer is created at the point of contact, insulating the liquid from the surface! The same physics applies for the super-cold LN on a surface at room temperature, as for the room temperature water on the hot stove top – it’s all about the relative change in temperature. So, in theory, it should not be damaging to pour LN over exposed skin (barring a few caveats, discussed later), as the initial LN that hits the skin first will vaporize immediately and insulate against the bulk of the LN that follows. Right? I must admit that I was a tad nervous about going through with this. I had never seen this particular demonstration performed in real life, only in YouTube videos while researching exciting things to do with LN . And knowing that ‘in theory it should be okay’ and ‘they did it on YouTube’, hardly constitutes sufficient criteria for attempting a potentially dangerous experiment on oneself! I asked Jeff Cady, who runs the lab demonstrations at Caltech, whether this is something I could safely do. He said that my arms should hold up fine against a cup of LN , but that I may end up freezing my arm hairs off. I was not sure whether he was joking or not. He also told me that experienced lab demonstrators used to gargle liquid nitrogen and snort out the vapor, but then they stopped doing this once they found it was bad for teeth enamel. This, he was not joking about. So with a cup of LN in one hand, I gingerly poured the cup of liquid over my outstretched arm. What followed was a very strange experience. I could feel the weight of the liquid hitting my arm, but there was a complete lack of any sensation of temperature or wetness that one would usually expect to follow such an event. As predicted, the bulk of the liquid rolled harmlessly down my arm and onto the ground. Afterwards, my arm did not feel even the slightest bit chilled (and the hairs remained intact). Overall it was great fun! Naturally I peer pressured the camp leader Amanda to also have LN poured on her arm. The expression on her face was classic. She also came through unscathed. Afterwards, one of the children also enthusiastically volunteered (me next, me next!). I decided not to push my luck. 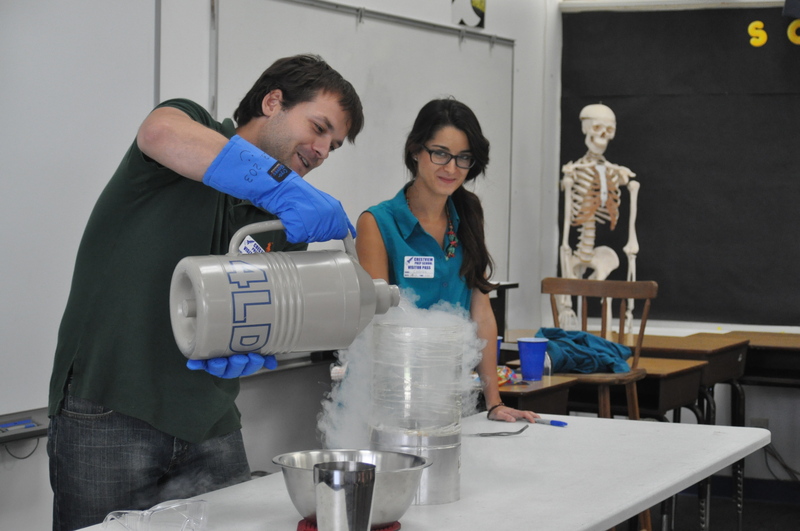 I pour a cup of liquid nitrogen over Amanda’s arm while she looks on in terror. Don’t worry, she was fine afterwards! So, is the Leidenfrost effect a magic shield that will completely protect you from the freezing effects of LN ? Only to a limited extent. If I were to repeat the experiment with a cupped hand, such that the LN had a chance to pool, then the Leidenfrost effect would no longer be sufficient to insulate my hand – it would likely be badly burned. One could also be burned if the LN found other places to pool, such as cuffs or folds in clothing, on jewelry or inside shoes. Sensitive tissues, such as eyes, could also be permanently damaged from just a splash of LN (which is why you should wear goggles when handling LN ). Don’t try Leidenfrost demonstrations at home. 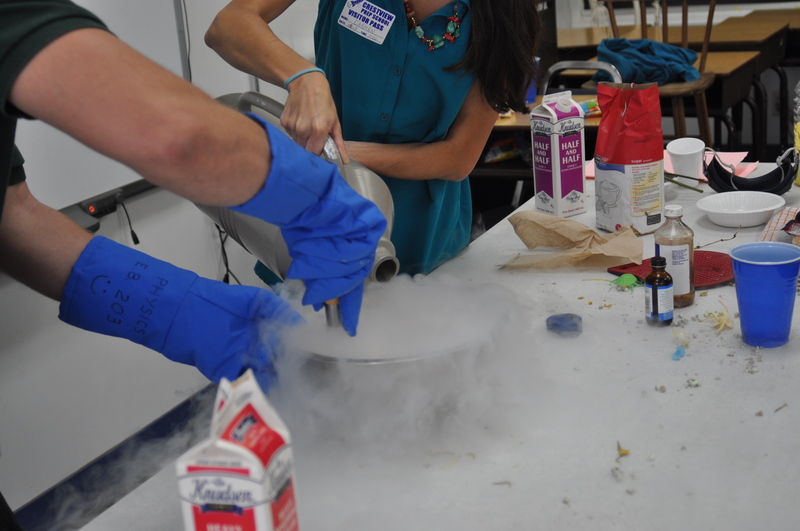 Science ice cream: I saved the best demonstration for last: liquid nitrogen ice cream! I was surprised how easy this was to make; just mix cream, milk, sugar and a touch of vanilla essence in a bowl, then pour in the LN while stirring. The mixture bubbled and gave off copious amounts of vapor, looking for all intents and purposes like a witch’s cauldron, but a minute later all that remained was super-tasty vanilla ice cream. 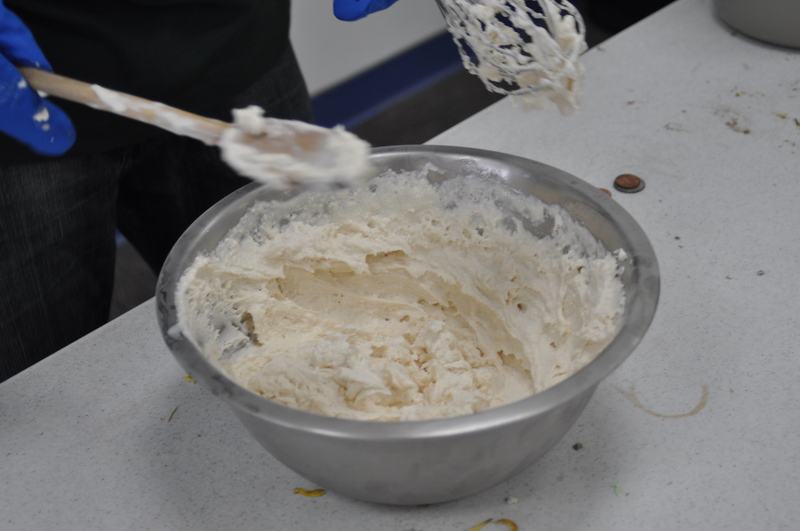 Liquid nitrogen ice cream is renowned for having an exceptionally smooth texture (the quick freezing prevents the formation of larger ice crystals) and this batch lived up to expectations. Luckily there was enough for everyone to try; it was a big hit. For this reason alone, I recommend that everyone should try to make friends with a scientist that has access to LN ! Note that it took much more LN that you might expect, at least two liters, to produce the pictured amount of ice cream (again owing to the relatively small heat of vaporization of LN ). Carmen pours liquid nitrogen to freeze the contents of the bowl into ice-cream while I stir. All of the required ingredients can be seen in the shot: cream, milk, sugar and vanilla essence. Overall, demonstrating for the children, with their large degree of enthusiasm and excitement, was certainly a fun experience. And dealing with questions like: “is falling in a pool of liquid nitrogen worse than being on the sun?” was certainly a lot more enjoyable than the usual questions I would face after giving a physics presentation! Before leaving, I asked who among the children wanted to be scientists when they grew up, which was met with a large showing of hands. I choose to interpret this as a sign of a successful demonstration (despite receiving an equally enthusiastic response when asking who wanted to send Carmen to prison). At least the more stringent standard of success was met: no cryo-burns sustained and no frozen children. Acknowledgements: Thanks go to Crestview Preparatory School, and also to Amanda and the other counselors of her Voyager camp, for allowing Carmen and myself to come and wreak cryogenic havoc. I would also like to thank the children attending the camp for being great fun to work with! Thanks also to Carmen for coming along (and skipping her group meeting, no less) to help out. Special thanks goes to Johannes Fink and the Painter group (part of the IQIM) for supplying the LN and transport dewar, and also to Jeff Cady, who runs the Caltech lab demonstrations, for lending demonstration equipment and for helpful advice. 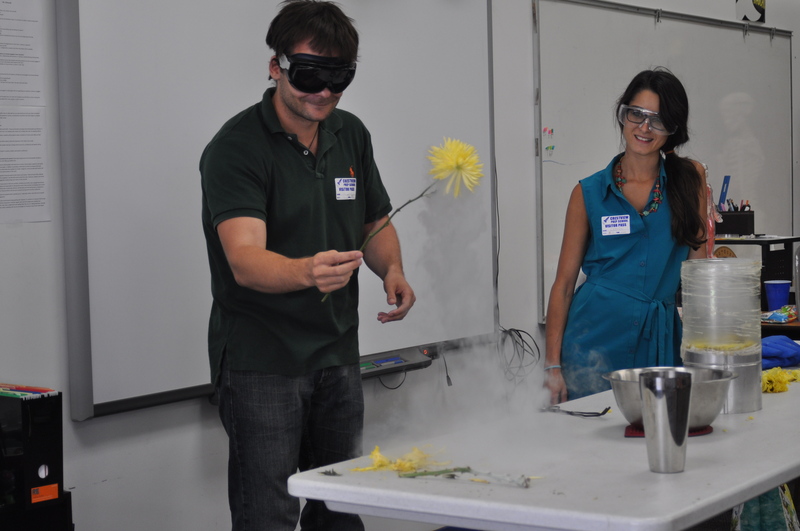 About me: This is the first time that I have contributed to the IQIM blog, so it is probably good to give the low down on myself and what I do (aside from pouring liquid nitrogen on people). I have been a postdoc in John Preskill’s group since October 2011 and my research is focused on entanglement based algorithms for the efficient classical simulation of (certain types of) quantum many-body systems. I am originally from New Zealand, where I did my undergraduate studies at the University of Auckland before moving to Australia to do my PhD at the University of Queensland (under Guifre Vidal, a former IQI postdoc). 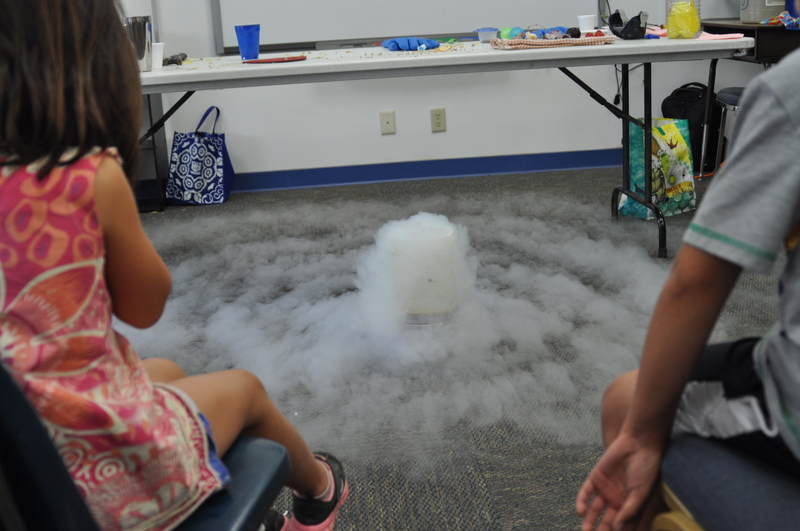 This entry was posted in Real science and tagged Leidenfrost effect, liquid nitrogen, LN2, summer camp by glenevenbly. Bookmark the permalink. Great demo!! It’s so neat to see how kids respond to these demos. I was unaware of the ice cream demo, as well as the one whereby you pour LN2 onto your arm. BTW, I like the one where you place a balloon (blown up and tied) in a vat of LN2. The balloon will begin to collapse as the water vapor in the balloon turns to ice. Then, when the same balloon is carefully extracted from the vat and placed outside (without shattering it), it will reverse its evolution and begin to expand. As it does, a strange crinkling sound is heard, which adds to the excitement! Have fun! David. Your demonstration sounds like it was really fun and very kid friendly. I have a brainiac 11 yr. old boy who is researching and doing some similar experiments without a “pro” to guide him. He is fascinated by this type of science and would love to be part of one of your demonstrations. Please let us know if you do another one! !